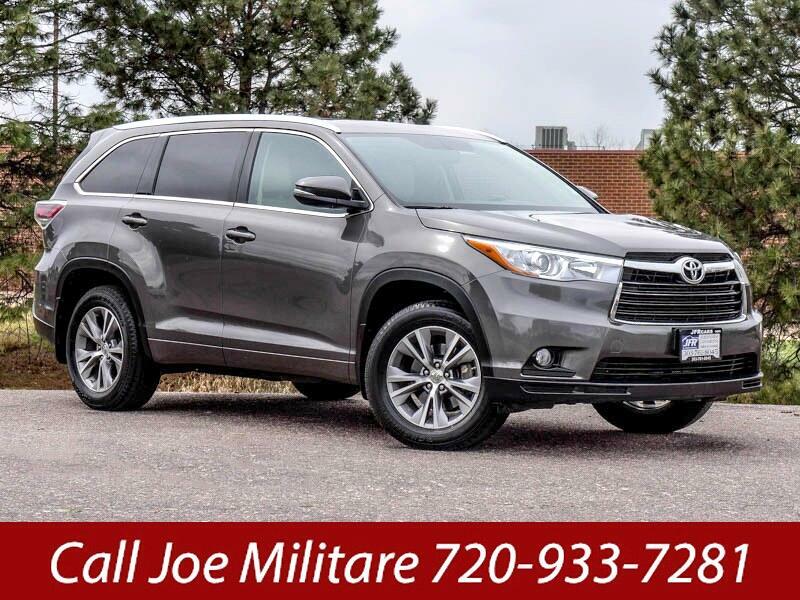 Used 2015 Toyota Highlander XLE AWD V6 for Sale in Littleton CO 80120 JFR & Associates, Inc.
Do you need room for up to eight people? Would you like a quiet and comfortable ride? How about fuel economy and good performance? Are you maybe towing up to 5,000 pounds now and then? If you answered yes to any of these questions then this one owner Toyota Highlander might be the perfect SUV for you and your family. The cabin offers plenty of room for you and your passengers and all their toys. This top "A" rated Highlander also comes with new tires and offers the best of everything. It's genuinely adult and family friendly. You'll appreciate the power of this tried-and-true V6 engine. Whether you're merging in traffic or headed up to the mountains, you'll always have that extra kick of power when you need it most. This Highlander comes with a fantastic array of options like second row folding seat, tilt wheel, sunroof, leather seats, keyless entry, power tailgate, heated front and second row seats, a backup camera, front power lumbar seat, aux audio jack, backup sonar, Bluetooth integration, plus lots more to make your driving experience more enjoyable. Call Joe Militare at 720-933-7281 if you have any questions or if you would like to schedule an appointment to see this vehicle.